This book explains the New Testament in its simplicity and in its entirety. Understanding Essentials of New Testament Doctrine will unlock the entire message of the Word of God. As the New Testament is made clear as never before, you will be energized to read the entire Bible as God intended --- as a revelation from the mind of God direct to you. The progressive revelation of God begins with the Law as schoolmaster and peaks with the New Testament message of the central and total role of Christ as Savior and center of history. It is completed in the revelation of the Mystery of God given to the apostles Paul, John, and others. You will learn Who and What God is. You will learn Jesus Christ's present position as God's Firstborn Son and Captain of your salvation. You will learn your present status and future destiny in the family of God in the resurrection. You will be in awe of your full inheritance and destiny as a child of God --- a future shared by all mankind. 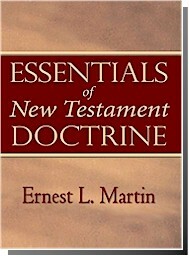 Dr. Ernest L. Martin wrote the Essentials of New Testament Doctrine to reveal what Christianity is all about. It is a primer that puts into your hands all the fundamental teachings of true Christianity. "It is with much pleasure and thankfulness to God and Christ Jesus that they allowed me the opportunity to record these principal truths of the Holy Scriptures. I hope and pray that all who read this book will rejoice in the revealed teachings of the Holy Scriptures. The pristine message of God as shown in the Scriptures is glorious beyond compare. This book is designed to be read from beginning to end (in a progressive manner). I have provided no index so that you will read it in this progressive fashion. I feel this method presents the Gospel of Christ in the best possible light. This book (when you finish reading it) will show you who you are. And once you know who you are, you can then direct your life in accord with your knowledge of your royal heritage and your awesome potential." Ernest L. Martin, Ph. D.